Sandalwood essential oil is steam distilled from the wood and roots of the Sandalum album and Santalum spicatum evergreen trees. Sandalum album is an endangered species. It can take 15 to 30 years before a tree is ready for harvest which has resulted in over-harvesting. Santalum spicatum is sustainably grown in Western Australia and harvest of the trees is overseen by strict government regulation. This oil is another one of those that is quite expensive but can be bought in 3% to 5% dilutions which are much more affordable for the handmade soap maker. Has anti-bacterial, anti-depressant, anti-septic, aphrodisiac, astringent, calmative, emollient, fungicidal, insecticidal and sedative properties. Is thought to be beneficial for acne, anxiety, cracked and chapped skin, depression, dry skin, insomnia, nervous tension, scarring and stress. 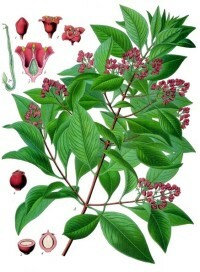 Often used as a fragrance and fixative component in soaps, especially oriental fragrances. The colour ranges from a light yellow to a deep golden and has a sweet balsamic wood scent. Is non-toxic though may cause skin irritation in some individuals. Blends nicely with floral oils, citrus oils, black pepper, clary sage, clove, frankincense, mints, myrrh, oakmoss, rosewood, vanilla, and vetiver.